Product Description: Our good friend Rose Levy Beranbaum has come out with some pie baking tools to help you make pie baking as easy and enjoyable as it can be. Her three-piece kit consists of Rose’s Magic Rolling Pin, Rose’s Magic Dough Pastry Mat and Rose’s “Fast Tracks” (each item is available separately as well). 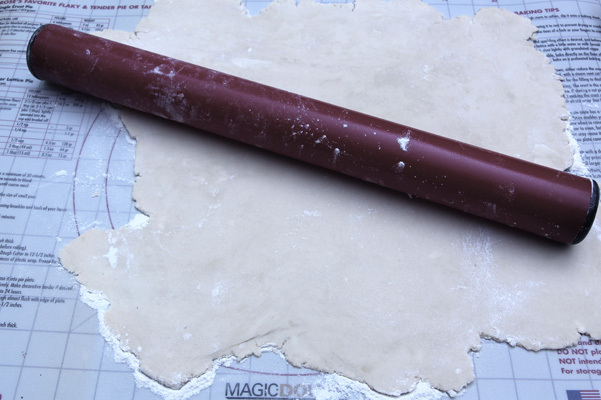 Rose’s Magic Rolling Pin is 18-inches long and 2-inches in diameter and made from non-stick SynGlas. It is extremely lightweight and dishwasher safe and comes in red, pink, white, blue and natural. 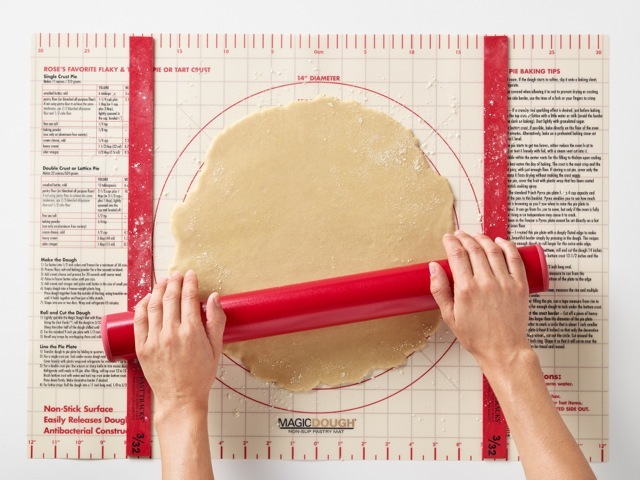 Rose’s Magic Dough Pastry Mat is a nonstick rolling mat that measures 24.5-inches by 18-inches and features both a non-slip backing as well as Rose’s pie crust recipe and tips printed right on the front. It has several measurements, round (for classic pie crusts) as well as a linear grid and a conversion chart among other helpful information. 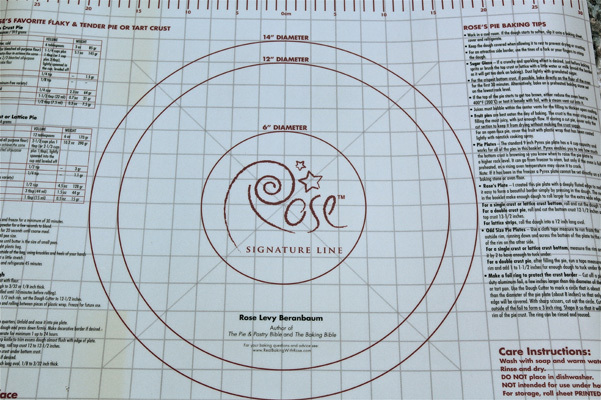 Rose’s “Fast Tracks” are simple tools that ensure consistent dough thickness when rolling. The kit contains three pairs that are 18-inches long by 1-inch wide. There is a 3/32-inch that she recommends for pies, a 1/16 for tarts and galettes and a 1/8-inch for cookies. All are dishwasher safe silicone. Image above courtesy of realbakingwithrose and American Products Group, Inc. Photo by Stretch Tuemmler. Test Kitchen Overview: We pay attention to anything that Rose recommends, as she is a stickler for detail and function. She sent us this kit for review and I have to say I was most excited about the mat. It is extra-large, able to handle anything we are rolling out in our Test Kitchen. The non-slip backing has a good grippy feel, while not being sticky, and it doesn’t mar surfaces. We tried it with pie crust as well as a rich cream cheese rugelach dough and it worked very well with just a tiny bit of flour dusted over the surface. The pin is quite nonstick, however its ultra-lightness threw us for a loop at first. We think there is a learning curve with this one. As we continued to use it, we liked it more and more, but it felt very different beneath our hands from what we are used to. We like that it is so wide (18-inches); makes it very easy to roll out crusts for extra large pies in particular. The “Fast Tracks” work well, but we have used products like this before. They do help one roll out a nice even piece of dough. Pros: With the mat it doesn’t matter what your kitchen surfaces are – this tool provides the perfect rolling surface no matter what. Its extra-large size is perfect even for larger pies and baked goods. We like that the mat is jam-packed with all sorts of tips and recipes from Rose right on top of the mat. The pin comes in colors to match your décor. We have several different types of pins in our kitchen and use different ones for different purposes. This pin is especially good for sticky doughs. The “Fast Tracks” can help you roll out evenly if that is something that eludes you. Also, the tracks store inside the pin, which means you will never misplace them or take up unnecessary room. Cons: None per se. You do not need this mat, but it certainly made rolling out a breeze. If you have struggled with rolling out piecrust in the past, this would be a great item to try. The rolling pin is nice is you need one, although we don’t think it will replace our heavy wooden one. (We are looking forward to trying it with marzipan and chocolate plastic where we think it will shine). We don’t consider the tracks a must, but again, if you are a pie fiend and like gadgets, get the kit! Suggested Use: Anytime you are rolling out piecrust, pie dough or pastry doughs. Where to Buy: Direct from Rose, through Amazon or Food52. Price at Time of Review: $59.99 for the three-piece kit. (Slightly less at Food52).